So how are we to understand neheh and djet? The closest we can come is a pair of concepts such as “change” and “completion/perfection” . . .
We can also illustrate the Egyptian disjunction of time with the help of the concepts “come” and “remain.” It is often said of neheh-time that it “comes”: it is time as an incessantly pulsating stream of days, months, seasons, and years. Djet-time, however, “remains,” “lasts,” and “endures.” It is the time in which we distinguish the completed, that which has been effected in the stream of neheh-time, which has matured into completion and has changed into a different form of time that will undergo no further change or motion. The term neheh refers to the cyclical nature of time as expressed in the passage of seasons and celestial events, the time that is not linear, but goes in a spiral with the repetition of certain events: day and night, seasons, holidays, and the natural cycles of life. Neheh’s cyclical nature can be observed in the hieroglyphs that make up its symbol, all of which are characterized by curves or non-linear surfaces: the top wavy line standing for water, the two hieroglyphs at each side that are the wick of oil lamps that burn in the night, and the circle with a point in the middle, universal symbol of Ra, the sun itself. . . . So we begin to get this conceptualization of a time which belongs to this earth, and a time that belongs to the cosmos, or celestial events, equinoxes, the movement of the sun and stars, etc. Neheh is generational time and repeats, whereas djet is permanent and unchanging in eternity. The model of “one eternal round” illuminates both views, eternal repetition and permanence (cf. 1 Ne. 10:19, notice also the dual usage of “times of old” and “times to come”; Mosiah 3:5; Alma 7:20; Alma 37:12; D&C 3:2; D&C 35:1; D&C 39:22; D&C 72:3; D&C 132:7, 18–19). This also conveys the thought that the gods were capable of eternal change while still being unchanging, since both symbols were bestowed by them upon the kings and queens, the repitition of an enduring process ad infinitum. This perception of time does not have a place in Western thinking, but hearkens back to the ancients. Such an explanation of time seems perfectly in keeping with Abraham’s discourse on the multiplicity of time measurements in Abraham 3. More home runs for Joseph Smith. Otto avers that, while nhh conveys the idea of “unending recurrence of the same, the concept of becoming, something like our ‘development,'” dt denotes “ineradicable endurance,” a state of being established to last forever. Thomas Allen’s translation of the Book of the Dead supports this, rendering nhh as “endless occurrence” or “endless recurrence” and dt as “changelessness.” … while A. Bakir has the idea that “… nhh connotes the concept of infinity associated with time before the world … came into being,” while “dt refers to the other infinity … the time when the temporal world comes to an end” … Gardiner has much the same idea, i.e., that dt is “eternity in the past” and nhh “eternity in the future” [see 1 Nephi 10:19] . . . A clear distinction is made in Book of the Dead chapter 17: “Others . . . say that the things which have been made are Eternity (nhh), and the things which shall be made are Everlastingness (dt).” . . .
“The nhh-eternity thus designates the unceasing recurrence of the same, the endlessness of time.” He agrees with Thausing that nhh is divisible into years, while dt cannot be so divided. . . . Thank you for the article! Yesterday I have read it. Today during Sacrament meeting I took symbols of body and blood of the Lord. And then I’ve seen those two hieroglyphic words – neheh and djet. And inside of them I’ve recognized water and loaf of bread! 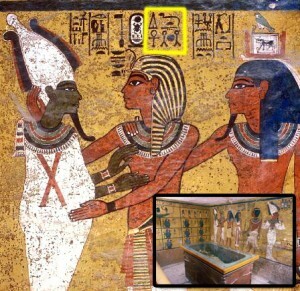 Could there be a connection between the familiar for all of us symbols of water and bread and the Egyptian neheh and djet? Seems to me to be two cosmological images readily seen by looking in the sky. Nhh is the time that is recurrent and cyclical which matches the changing stars of the ecliptic throughout the year. Meanwhile, Dt is eternal and unending, which is seen as the circumpolar stars that never set. In ancient cosmologies the “Earth” was really the integration of the horizon with the sky. 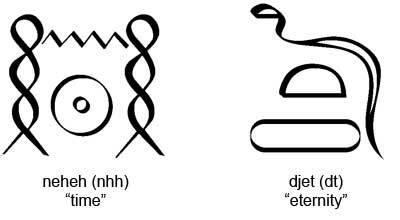 In fact the hieroglyph for Nhh seems to be an artistic rendition of the two knot points of the sun on the horizon, i.e. the solstices, with the equinotical sun in-between. As the stars change behind the rising of the sun during these days throughout the year this is seen as recurring yet cyclical. This is the temporal earth amidst eternity. The other glpyh shows the cobra above the earth, perhaps another artistic rendition of the stars that never set and are therefore the enduring and unending space of eternity which stands over the Earth, these are the “waters above” which helped birthed the temporal plane. Credit to Dave Butler who pointed out the suggestion that “time” and “eternity” could be imagined as the ecliptic and the circumpolar stars. In any case, great article and it certainly gets one thinking.